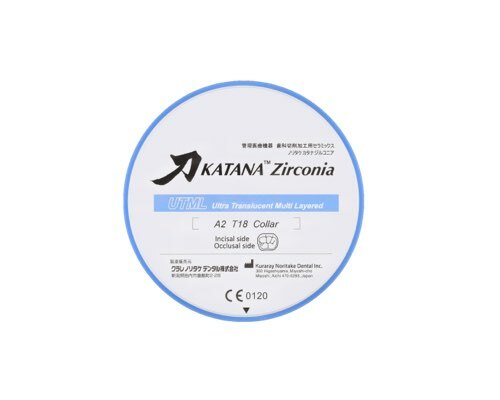 KATANA Zirconia UTML is the most translucent among the series and is recommended for fabricating anterior crowns or laminate veneers. Two different shade types are available: Standard shade and Enamel shade. Blue stripe on puck. Making natural veneers and other anterior prosthetics from zirconia? YES. KATANA Zirconia UTML is so translucent that light reaches the original tooth color, bringing you the natural result you need. This zirconia has one of the highest translucency levels on the market, as well as a natural color gradient. The next time you plan to fabricate a veneer, think about milling KATANA Zirconia UTML. You will be thrilled using zirconia in a totally new way. Design a restoration using the suggested guidelines for minimum wall thickness. * Thickness only for zirconia without porcelain build-up. Keep 0.8mm in case of porcelain build-up. You can reduce to 0.4mm when finishing with glaze and polish. KATANA™ Zirconia UTML is the most translucent among the series recommended for fabricating anterior crowns or laminate veneers. Two different shade types are available: Standard shade and Enamel shade.